Another important aspect of homemade tattooing is the location in which the process takes place. 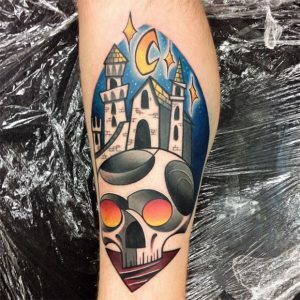 Pursuing the logical layout of thought, it can be concluded that homemade tattoos have to be made at home, however, on practice this statement gets a little blurry. First of all, many active artists of the genre are tattooing at their homes, then why don’t their home become studios, though unofficial, but still institutionalized by repetitive practice that takes place? And if so, then do homemade enthusiasts who tattoo friends exclusively and free of charge fall into this category? Indeed, in most cases it can be said that the setting in which homemade tattoos are made has to be informal or even unconstrained place. The setting where tattooing takes place can be really important, no matter if it is someone’s improvised home-studio or a rooftop, the idea of tattooing in the places that are not actually designed for that is pretty common among homemade tattoo enthusiasts (Goh 2013). On one hand, this can be seen as an opposition of the movement to the mainstream one and emphasis on the “realness” of homemade tattoo. This dichotomy (real/fake), though is rarely seen within tattoo discourse (at least when referred to the location of the tattooing) can be perfectly applied here. This can be based on the motives of the artistic essence of homemade tattoo (practiced in unappropriated place for the sake of art not money due to the lack of official control) as opposed to the parlor one (which here appears a part of business, a service being provided in a standardized way with prescribed procedures). On the other hand, choosing an exotic place for tattooing can be caused by the intimacy and magical-ness participants are trying to reach. Indeed, if the process of homemade tattooing is seen as an extremely intimate symbolic act, similarly to shamanism, the setting plays an important role of spiritual atmosphere builder. Third, more pragmatic explanation that deals with exotic places chosen for tattooing that are sometimes publicized by media is the aim of self-promoting, so to say, marketing of the counter-marketing movement, however this side of homemade tattoo will be considered in more detail in later sections.